Despite my best intentions, I do not have a good track record of participating in Improv Challenges this year. I actually made recipes for the January and February ingredients but just could not manage to get them posted in time to share for the challenge. 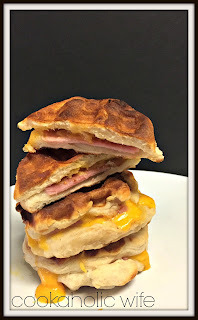 I actually scheduled this post back in January and the title was “April Improv Challenge: Ham and Cheese MUST PARTICIPATE! !” Why the excess punctuation and capitalization? Well, because last year we were asked to think up some ingredient combinations and submit them for this year. I submitted ham and cheese so naturally, it would just be wrong not to participate in a challenge of the ingredients I picked, right? That still didn’t make picking a recipe easy. 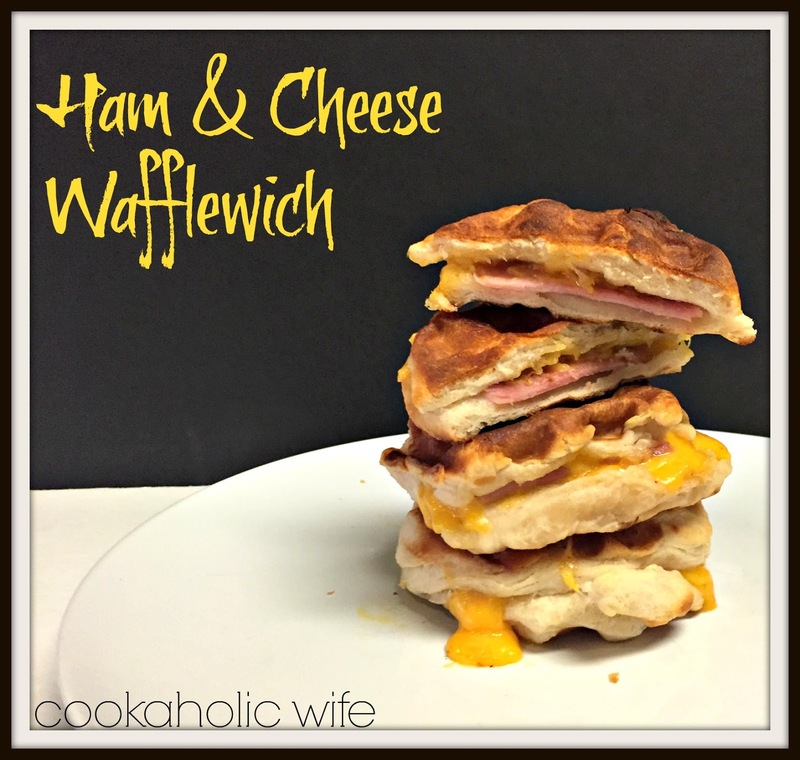 Ham and cheese is such a classic combination that trying to find a recipe that wasn’t obvious was harder than I thought. 1. Heat up your waffle iron and spray with non-stick cooking spray. 2. Remove the biscuits from the can and separate each biscuit into 2 pieces. Use your fingers and press down on the dough, rotating in a circle until the biscuit is even and flattened. Repeat with all biscuits. 3. 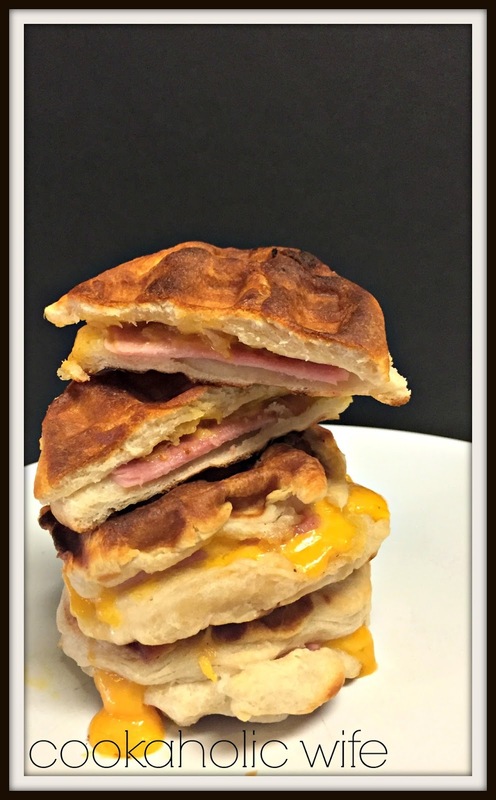 Place a slice of ham and a slice of cheese on one side of the biscuit. Add about 1 1/2 tablespoons of scrambled egg on top if using. Place the other half of the biscuit on top and press to seal the edges, folding them under or crimping them. I put the scrambled egg in Tom’s wafflewiches and left mine just ham and cheese. I think I could have spiced mine up a bit by adding a dollop of grainy or brown mustard, but they were still delicious as is. Tom said he really liked adding syrup to his, but that’s a combination my brain can’t get around. Oh yummy! My youngest will want to try this! Mmmm – these look like fun tasty sandwiches! This is reason number 5469 I need a waffle iron. These would be fabulous for breakfast or lunch with just some fruit. YES! What fabulous wafflewiches. I'd probably use mustard and maple honey ham because I like Tom's syrup idea, but am a little too squeamish to actually follow through with it.